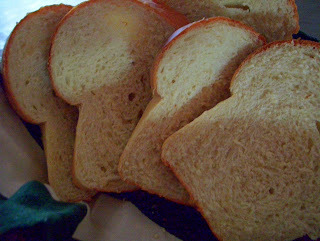 Italian and French breads, typically, do not have any eggs in their ingredients.These breads are white with a crisp-crust and have a light texture and tend to be dry. Egg breads, on the other hand, have a moist and somewhat dense interior with a yellow hue. Egg bread dough is often made into holiday sweet breads, Hawaiian breads and sweet rolls. When made into Classic Egg Bread, slices of this loaf are wonderful companioned with honey or butter. I also love egg bread served with a hot bowl of chili or soup, toasted for a BLT or saved back for a day or two to make a delicious French toast. (I allow this bread to rise more than double to insure an even, lighter texture). Place all ingredients in a bread machine in the order suggested by the manufacturer. Select dough cycle for best results. After cycle is finished, remove dough and roll out on a floured board. Roll dough to form a loaf. Place into a greased loaf pan. Cover and let dough to rise in a warm place until doubled in size. Bake bread in a preheated 375 degree oven for 25-30 minutes until done. Bread may be tented with foil if top browns too quickly. Remove pan from oven and carefully release bread onto a wire rack. Stand upright to cool. Slice and enjoy. 214. Fruit-Cake Bread, Better than Good!